Our band leader, Swedish jazz man, trumpet player, singer, arranger and composer, Rolf Sundby unexpectedly passed away on July 16, 2010. 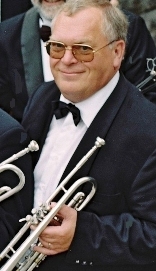 He was born in 1938 in south-east Norway, learned to play the trumpet and the cornet as a boy, took an interest in jazz and soon began to play in local jazz bands. Having graduated in chemical engineerig he moved to eastern Sweden, where he for many years played in different big bands as well as smaller combos. In the 1980's Rolf and his family moved to Göteborg, where he gradually became one of the leading personalities on the local jazz scene, being a member of some of the best bands in town. From 1986 he was the leader of and main arranger for the Vintage Jazz Big Band, a 12 piece band with a repertory mainly from the early black big bands like the bands of Duke Ellington, Fletcher Henderson and Luis Russell. Rolf had a great stage personality, his trumpet tone was powerful and his technique brilliant, and he sometimes added a burlesque touch to his singing and presentation. He will be greatly missed.